The Illinois State Archaeological Survey (ISAS) is part of the Prairie Research Institute at the University of Illinois at Urbana-Champaign, which is centrally located between Chicago, St. Louis, and Indianapolis. For 80 years, the University of Illinois has studied the state’s archaeological heritage. ISAS incorporates that knowledge in its programs to protect, preserve, and interpret these irreplaceable and non-renewable resources within the context of Illinois’ need to encourage and promote sustainable development. Learn more at go.illinois.edu/PRIjobs. ISAS is seeking an Assistant or Associate Research Scientist, Environmental Archaeologist (assistant or associate level is dependent on qualifications) to develop, plan, conduct, direct, and participate in specialized research programs of significance for climate and environmental-focused archaeological/anthropological research. This position is based in Champaign, Illinois. Provide problem-oriented geo-archaeological, sedimentological, hydrological, and/or bio-chemical expertise that complements current and future ISAS research in the North American Midwest focused on landscapes, long-term cultural and climate change, agricultural development, and migration. Identify relevant research needs and project opportunities. Develop proposals for external funding and secure funding to support independent research. Serve as principal investigator, lead research projects, and perform tasks in that capacity including management of grant funding and efficient production of project, grant, or contract reports and deliverables. Collaborate with survey scientists, University of Illinois faculty, and external colleagues to provide integrated interpretations and applications to existing and new research programs. Prepare internal reports, reports to sponsoring agencies, and scientific reports for publication in Survey publications. Publish the results of original research in high-quality, peer-reviewed scientific journals and other outlets that have a rigorous review process. Interact extensively with land managers, stakeholders, and the public. Provide authoritative and current information on the results of research projects for the public, other scientists, industry, and/or governmental agencies, and effectively communicate research results through writing and public speaking. Supervise and lead staff to achieve success and foster a culture of innovation and high-level performance at both the individual and organizational levels. For direct reporting staff, this also includes task assignment, scheduling, ongoing performance monitoring and evaluation, career/position mentoring, and leave/travel approval. Ensure the safety of staff and equipment. Contribute in the areas of education, outreach, and/or other service to the Survey, PRI, the University of Illinois, and the state of Illinois. Mentor graduate students within the University of Illinois and/or other regional universities. Enhance the reputation of the Survey and PRI at the state and national level. Actively participate in professional societies and associations. Attend scientific conferences and sponsor-led work groups as a technical expert and present papers and results. Assistant Research Scientist qualifications: Required: Ph.D. in anthropology, archaeology, or closely related field with a geoarchaeological or biochemical specialization. Alternate degree fields will be considered/accepted depending on the nature and depth of the experience as it relates to this position. Experience in academic research environment. Experience administering and conducting field and laboratory research in the Americas. Supervisory and/or team leadership experience. Ability to establish a research program which includes both independent and collaborative research projects. Potential to effectively acquire and manage project funds and resources. Capacity to effectively manage research as a principal investigator and effectively supervise and mentor associated personnel. Early career track record for publishing in high-quality, peer-reviewed scientific journals. Effective communication, personal relations, organizational, and leadership skills. Demonstrated ability to perform effectively in a diverse and fast-paced work environment consisting of multiple and changing priorities with stringent deadlines, under minimal supervision. Attention to detail, sound judgment, and strong conflict resolution skills. Affinity for cooperative or interdisciplinary research with scientists at the Survey, professionals at other Surveys or other academic units, as well as governmental and other academic institutions. Proficiency in commonly-employed software and databases. Valid driver’s license. Preferred: Experience conducting archaeological research activities. Established field research site or program. Experience incorporating extant archaeological collections into current research. Research interests in the Mississippi valley. Experience in cultural resource management. Background as a North American archaeologist with geo-archaeological, sedimentological, hydrological, and/or bio-chemical research that complement that of ISAS staff and speaks to questions of climate change, food production, ecology, society, and the Anthropocene. Record of active participation in professional societies and associations. Associate Research Scientist qualifications: Required: Ph.D. in anthropology, archaeology, or closely related field with a geoarchaeological or biochemical specialization. Alternate degree fields will be considered/accepted depending on the nature and depth of the experience as it relates to this position. At least five years' experience in specialized area of research. Experience in academic research environment. Experience administering and conducting field and laboratory research in the Americas. Supervisory and/or team leadership experience. Background as an Americanist archaeologist with geo-archaeological, sedimentological, hydrological, and/or bio-chemical research that complement that of ISAS staff and speaks to questions of climate change, food production, ecology, society, and the Anthropocene. Ability to establish a research program which includes both independent and collaborative research projects. Capacity to effectively manage research as a principal investigator and effectively supervise and mentor associated personnel. Has a sustained progression of professional development that includes publishing research findings in high-quality peer-reviewed scientific journals, external funding, mentorship, leadership and service. Record of active participation in professional societies and associations. Effective communication, personal relations, organizational, and leadership skills. Demonstrated ability to perform effectively in a diverse and fast-paced work environment consisting of multiple and changing priorities with stringent deadlines, under minimal supervision. Attention to detail, sound judgment, and strong conflict resolution skills. Affinity for cooperative or interdisciplinary research with scientists at the Survey, professionals at other Surveys or other academic units, as well as governmental and other academic institutions. Proficiency in commonly-employed software and databases. Valid driver’s license Preferred: Background as a North American archaeologist. This is a regular full-time academic professional appointment, renewable annually based upon satisfactory progress in the position and continued funding. The starting date is negotiable and salary is commensurate with experience. To ensure full consideration, applications must be received by March 31, 2019; however, applications will be accepted until the position is filled. Applicants may be interviewed before March 9, 2019; however, no hiring decision will be made until after this date. To apply, please visit https://jobs.illinois.edu/academic-job-board to complete an online profile and to upload 1) a cover letter that clearly articulates how your qualifications and experience make you a viable candidate for this position and should address the qualifications listed above, 2) a résumé/CV, and 3) the names and contact information (including e-mail addresses) of three professional references. All requested information/documentation must be submitted for applications to be considered. Incomplete applications will not be reviewed. For further information please contact Lori Walston-Vonderharr, Human Resources, Prairie Research Institute, at lwalston@illinois.edu or 217-244-2401. For technical inquiries please contact Dr. Timothy Pauketat at pauketat@illinois.edu or Dr. Kristin Hedman at khedman@illinois.edu. The University of Illinois conducts criminal background checks on all job candidates upon acceptance of a contingent offer. "Under direction of the Division Manager of Historic Sites, manages all phases of the operations of the Cahokia Mounds Historic Site which has an annual visitor rate of over 400,000; acts as full-line supervisor over site staff (13 full-time staff members and volunteer support staff of more than 225) engaged in site maintenance, security, interpretive and other site program activities; supervises and participate in the preparation of sites operation and financial records and reports; prepares and monitors permanent and capital improvement projects and develops work plans; conducts research and implements interpretive programs for visitors and guests; establishes and maintains effective working relationships with interest groups, individuals and other government representatives; implements media information with agency personnel and represents agency as speaker at civic organizations or public event; plans, coordinates and implements site activities and develops programs related to site; manages and care for site collections, artifacts and equipment." Missouri State Parks has two archaeologist positions open. See links below for description and application information. Please share with anyone you think might be interested. Beloit College seeks a Director of the Logan Museum of Anthropology and Wright Museum of Art to begin July, 2019. The Director is responsible for the administration of the Logan Museum of Anthropology and the Wright Museum of Art and for working with faculty and museum staff to develop exhibits, programs, policies and plans, grant proposals, and manage resources. The Director supervises a small professional staff and reports to the Provost and Dean of the College. This is an twelve-month, full-time, administrative position with an adjunct faculty appointment in a relevant department. Click here for the full job announcement and application procedures. The Chippewa National Forest will soon be seeking a candidate for a temporary (not-to-exceed one year) Archaeologist (GS-0913-9) position in Cass Lake, Minnesota. The Chippewa National Forest is located in the Mississippi River Headwaters Region and has a dynamic cultural history spanning the past 10,000 years. The selected individual will assist the Forest Archaeologist (me) with the management of heritage resources on the Forest. Respondents will be sent vacancy announcement information when it becomes available. The purpose of this Outreach Notice is to inform prospective applicants of this upcoming opportunity. If you are interested, please respond to this outreach by close of business on August 31, 2018. Also, monitor www.USAJobs.gov for this vacancy. The Field Museum seeks a dynamic leader and researcher with museum experience to serve as Director of its Integrative Research Center and Full Curator. The Field Museum is one of the world's leading natural history museums with globally important research in Natural History, including Anthropology, Botany, Geology, and Zoology. Cahokia Mounds State Historic Site is accepting applications for Site Interpretive Coordinator. The job description and application procedures are listed here and can also be found at work.illinois.gov. Applications should be received by May 4, 2018. The Illinois State Archaeological Survey (ISAS), Prairie Research Institute (PRI), University of Illinois at Urbana-Champaign, is seeking a Historic Materials Analyst for its Central Offices, located in Champaign, Illinois. This individual will conduct analysis of historic materials from archaeological sites including all aspects of historic sample collection, identification, analysis, archaeological interpretation, and curation. 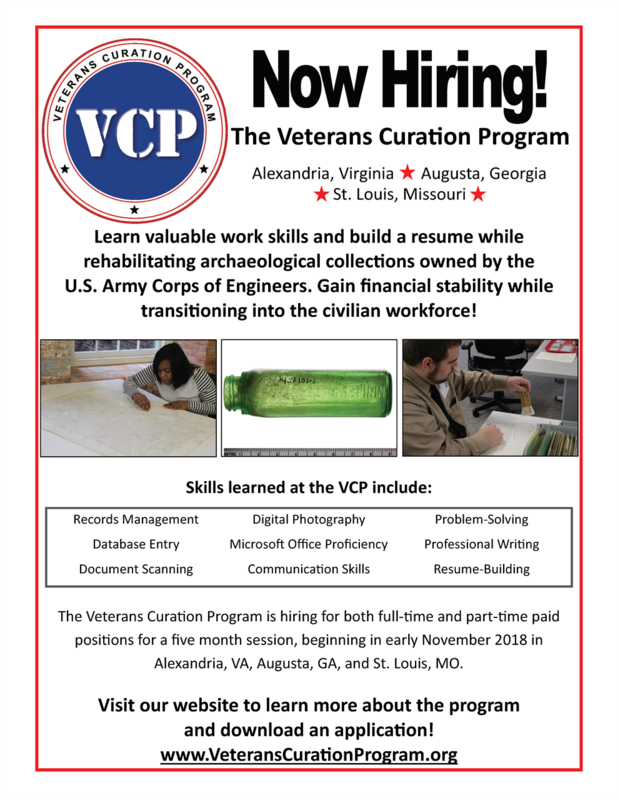 Associated duties will include the identification and recordation of American and European material remains from archaeological sites, including the quantification of results and preparation of appropriate tables, analysis and interpretation of the archaeological significance of the historic material remains, and the preparation of historic material analysis reports as appropriate. Work collaboratively in devising and maintaining a standard historic material classification-recording scheme, as well as collaborate with specific researchers in adjusting the scheme to suit their needs. Complete short reports on historic materials, covering all aspects of material culture, feature analysis, site stratigraphy, interpretation, and site significance for sites that do not require formal reports. Execute holistic spatial analysis incorporating vertical and horizontal distribution of diagnostic historic material artifacts, material and feature clustering, soil deposition and erosion, feature super-positioning, and intra-site artifact mends to delineate site cultural components. Maintain electronic and handwritten historic material laboratory databases, including but not limited to a historic material lab project-tracking database, a material comparative collection database, an artifact type comparative collection database, and individual site assemblage historic material analysis data. Perform reviews of the material assemblages and offer recommendations for all of the historic sites encountered during the surveys conducted by the Central Illinois Field Station (CIFS). This review includes checking material identifications, assigning date range estimates for the site components, checking site locations against historic maps and other resources, and make recommendations for National Register of Historic Places eligibility. Track samples through the analytic process by inventorying the movement of samples through the laboratory, maintaining electronic logs of individual site samples, and ensuring the analyzed samples are curated properly. Analyst coordinates with archaeological assistants to maintain and develop the Surveys historic material comparative collection and relevant reference material in order to facilitate specimen identification and interpretation, within the larger context of historic cultural manifestations recognized in the Eastern United States. Participates in Survey outreach activities for the general public, avocational societies, and school groups and records and maintains artifact data collected from avocational collectors. Acts as liaison, as appropriate, with other historic material specialists in the region. Participates in regional conferences and organizations; prepares presentations and articles on research activities and interests. The successful candidate should have a B.A. in Anthropology, Archaeology or closely related field, plus 3 years’ experience in conducting historic material investigations and analysis of historic sites in the Eastern United States cultural area. Detailed familiarity with the historical resources of Illinois, temporal and culturally diagnostic historic materials, and production technology and history. Demonstrated ability to complete historic material projects and reports in a timely and competent manner. Basic familiarity with all classes of material culture, feature types and functions, and site formation processes is also required. Basic familiarity with computer word processing, graphic and database programs. This is a full-time Academic Professional position. Salary is negotiable based on experience. Proposed starting date is as soon as possible after the closing date. The University of Illinois conducts criminal background checks on all candidates upon acceptance of a contingent offer. All candidates must complete an online profile which can be found at <http://jobs.illinois.edu>. Please upload a cover letter, resume detailing your relevant qualifications, and the contact information of three references through this system. To ensure full consideration your application and supporting documents must be submitted through this online system, and received by April 4, 2018. For further information regarding application procedures, contact Ms. Janice Pankey, <jpankey@illinois.edu>. Individuals having questions concerning this position should contact Dr. Robert McCullough, <mccullor@illinois.edu>.